WASHINGTON — Two competitors. Three months of flight demonstrations. And the opportunity to sell several hundred light-attack planes to the Air Force hangs in the balance. Welcome to the second round of light-attack experiments, which began May 7 at Holloman Air Force Base, New Mexico, and is expected to run through July. During that time, Textron Aviation’s AT-6 Wolverine and the A-29 Super Tucano, helmed by Sierra Nevada Corp. and Embraer, will be put to the test yet again. “We’re bringing the team together in the desert to look at primarily the logistics but also some of the weapons integration capability,” Lt. Gen. Jerry Harris, the U.S. Air Force’s deputy chief of staff for strategic plans and requirements, said at a May 7 Air Force Association event. At the end of the experiment, Air Force officials believe they will have enough information to decide whether to begin procuring light-attack planes that can execute combat missions in the Middle East at a cheaper price point than the fourth- and fifth-generation fighters currently in theater. Although the Air Force has been hesitant to spell out exactly how it could pursue a program of record, a source with knowledge of the program says the most current strategy is an accelerated bidding process. The service would put out a request for proposals by October, with an award projected within six months. Both the A-29 and AT-6 have arrived at Holloman, and the competitors are now gearing up for a couple months of rigorous flying — which Textron Aviation spokesman Tom Webster expects to reach up to six sorties a day. For the AT-6, Air Force pilots and weapon systems operators have already gone through classroom instruction and ground training that allows them to familiarize themselves with the cockpit, Webster told Defense News in response to emailed questions. From there, pilots will begin to operate the aircraft with SNC or Textron instructor pilots in the back seat before flying solo once the evaluation begins in earnest, Taco Gilbert, SNC’s vice president of integrated tactical solutions, said in a May 14 roundtable with reporters. The experiment is funded through a contract mechanism called Other Transaction Authority, which allows the Air Force and participating companies to share cost. Industry is responsible for providing flight instruction and logistics support for the aircraft. Meanwhile, Air Force maintainers and logisticians will scrutinize the jet’s maintainability as pilots fly mock air interdiction, combat search and rescue, close-air support, and armed overwatch missions in both day and nighttime conditions. It’s this emphasis on sustainment and logistics that differentiates the second phase of the light-attack experiment. The first set of demonstrations — held last summer at Holloman — focused on the aerodynamic performance and combat capability of the aircraft. The A-29 and AT-6 are both turboprop planes designed to operate in austere combat environments and land without needing a paved runway, but each company believes its aircraft has the edge. The AT-6 is based on the T-6 plane used by the U.S. Air Force and Navy for basic pilot training. That’s a huge benefit, as Textron will be able to rely on the existing supply chain to ensure aircraft are repaired quickly, Webster said. “We have the benefit of using many parts already well-established in the [Department of Defense] logistics pipeline and for which the USG [U.S. government] and Textron Aviation Defense have extensive databases relating to sustainability and durability facilitating just-in-time logistics,” he said. 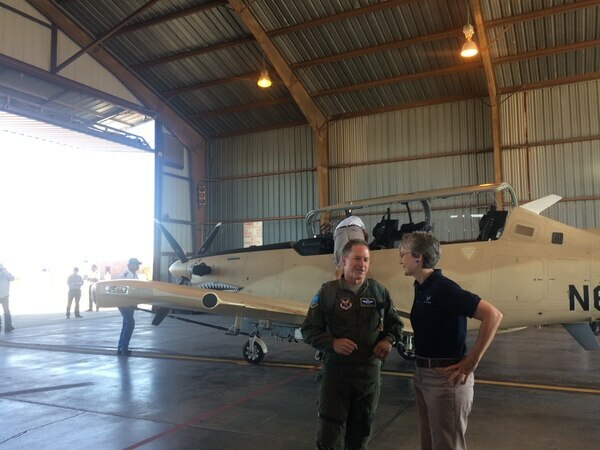 However, Gilbert touted the A-29’s recent experience in combat — the U.S. Air Force is buying Super Tucanos for the Afghan military — and said he’s confident the plane will ace the logistics evaluation. During last year’s experiment, the A-29 flew twice daily for about three months straight. In that time, the aircraft had only two maintenance issues: a worn-out tire and a failed component, both of which were replaced between flights, he said. “We did not lose a single sortie due to logistics. And when you can fly that many sorties under a simulated combat environment and you replace one tire, one component, I think that speaks very highly for the life-cycle cost of the aircraft,” he said. Following the exercise at Holloman, there will be a bonus round of sustainment demonstrations. During that portion of the experiment, SNC and Textron will walk through more intensive maintenance practices such as servicing an ejection seat or replacing an engine, Gilbert said. 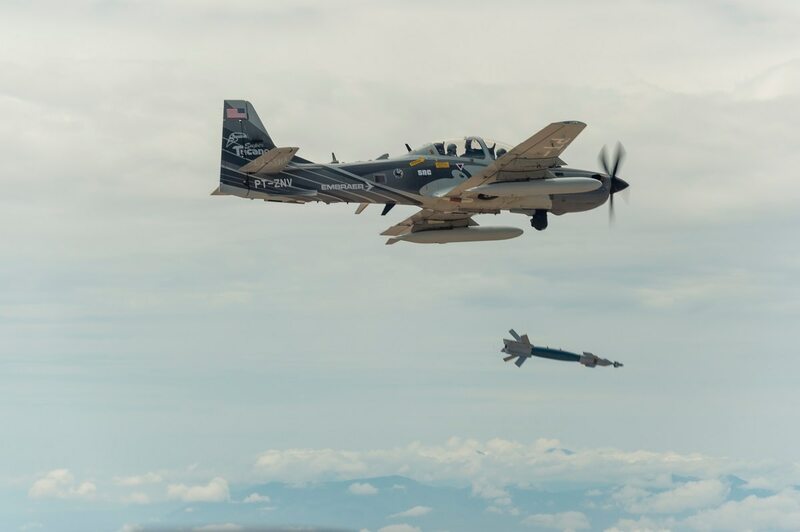 Beyond the sustainment portion of the assessment, the Air Force has indicated it wants to expand the network capabilities of the A-29 and AT-6 planes to ensure they can connect to U.S. and coalition aircraft. To address Air Force Chief of Staff Gen. Dave Goldfein’s vision of integrating an “easily exportable means of exchanging data with coalition allies across the air, land and sea domains of operation,” both platforms will integrate Aeronet, which will allow the United States to share unclassified data with partner nations, Webster said. The Air Force is also interested in integrating both aircraft with additional precision-guided munitions. “Since the last experiment, we have added some new weapons to include the APKWS [advanced precision kill weapon system] laser-guided rockets, which adds a great capability to the aircraft,” said Gilbert, adding that he could not say which weapons would be employed as part of the assessment. “At this point of time, we’re still sort of waiting to see ourselves,” he said. The service will evaluate the performance of the 1760 Weapons Data Bus, “which enables communication to and employment of ‘smart‘ weapons,” Webster said.